Each year I write to the Wesleyan community with an update on the university’s progress in relation to our strategic framework, Wesleyan 2020. 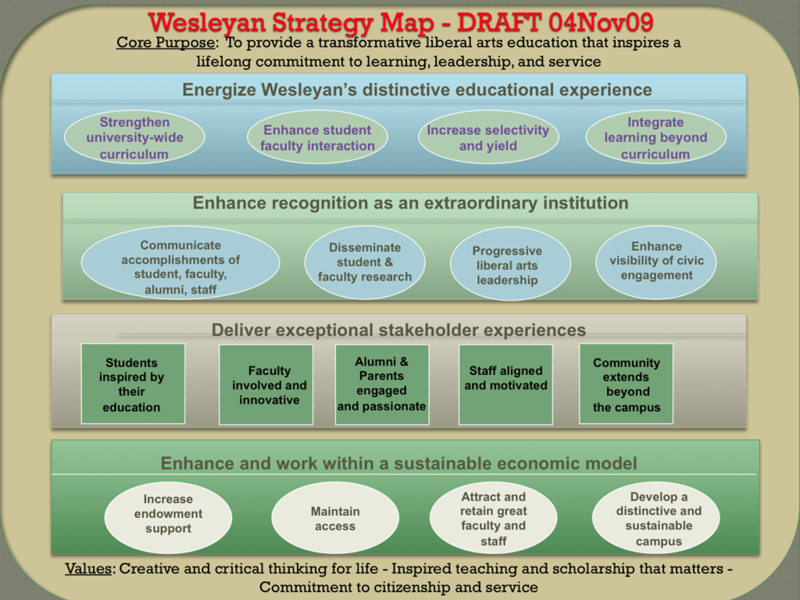 As you may recall, this document was approved by the Board of Trustees in 2010 and was the basis for a “strategy map.” We continue to use these guideposts to help us allocate our resources and to put the work we’ve been doing in a context for assessment and planning. Wesleyan 2020 outlines three overarching goals: to energize Wesleyan’s distinctive educational experience; to enhance recognition of Wesleyan as an extraordinary institution; and to work within a sustainable economic model while retaining core values. Attached to each goal are more focused objectives, and below I highlight some of the things we’ve been doing to meet them over the last twelve months. Having launched a suite of interdisciplinary colleges in recent years, over the past twelve months we have been nurturing their development. We have also revamped the administrative structure for Study Abroad and have been developing the Center for Global Studies. The new College of Integrative Sciences has taken the lead in creating a cluster of courses in Design and Engineering, and with the help of the Mellon Foundation we will begin offering classes in these fields next semester. This effort builds on the Data and Computational initiative of recent years. 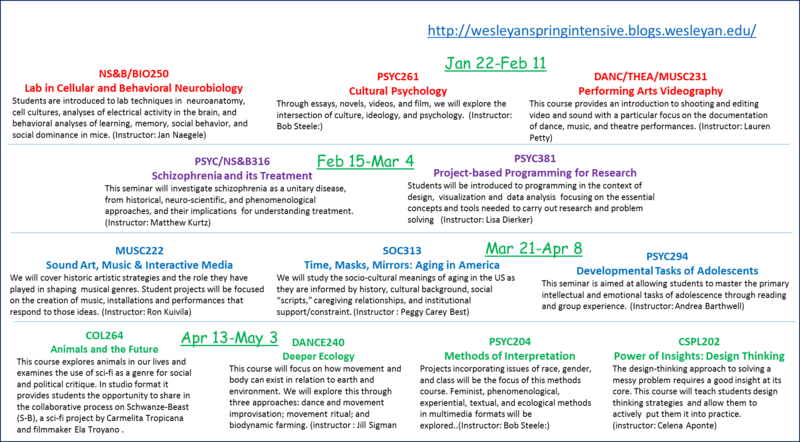 We’ve also been preparing a pilot intensive semester: a suite of four classes with students focusing exclusively on each class for roughly three weeks. This builds on the intensive winter and summer sessions introduced in recent years. Our objective in the 2020 plan is to “refine and refresh curriculum, exploiting academic strengths,” and the faculty has been doing just that. “Choose students who can most benefit from and contribute to Wesleyan” is another 2020 objective. This year’s frosh class was the most diverse in memory, and it has stellar academic qualifications. By becoming a test-optional school (no longer requiring standardized tests), we believe we will be able to recruit more talented students (and students who are more talented in different ways) from around the country and the world. We significantly increased our spending on financial aid this year, and attracting a student body diverse with respect to interests, ethnicity, economic situation, and geographical background remains a high priority. When we approved the 2020 plan, MOOCs were just a gleam in somebody’s eye. After a year or two of great hype, we are now settling into a pattern of improving and refining classes. In the past year, Wesleyan has been successful with two Requests for Proposals from Coursera for specializations: the first in data science, and the second in creative writing (forthcoming). Campus safety has been much on our mind over the last few years, and this continues to be a priority. We hired a new director of Public Safety, Scott Rohde, and he has made great strides in better integrating the work of our officers within the campus community. We have also initiated a Task Force to look at policy issues and educational initiatives with respect to the use of illegal drugs on campus. The quality and quantity of our applicant pool remains for us a key measure of recognition. After a decline in applications last year, we have seen a significant rebound for the class of 2019. Most important, we continue to receive applications of the highest quality from students who have already challenged themselves in high school, and who display a talent and appetite for learning in a residential context. Thanks to the efforts of a hard working and thoughtful staff, we remain a “lean” institution compared to our peers. We reversed “administrative bloat” some time ago, and we continue to exercise a great deal of fiscal discipline. This means saying “no” to some projects each year, but in the long run we are building capacity for the university. In my annual update last year I underscored that we were able to increase our “yield” among high-need students in the class of 2018 (meaning that we had a more economically diverse class). That yield proved even greater for the class of 2019. We continue to admit about 90 percent of the class without regard to their ability to pay. In recent discussions we have talked about the importance of ensuring that we are truly meeting “full need” of those who enroll rather than stretching dollars so as to get close to a “need blind” label. This, as I recognize each year, has been a shift from the 2020 framework. One of the key 2020 objectives is to “attract and retain faculty who are productive scholars, first-rate teachers and contributors to campus community.” And this year we’ve been successful in hiring extraordinary faculty who we are confident will remain dedicated to their students while they enhance their own fields of research. The group we brought to campus in the fall of 2015 was the most diverse in memory, and their talents extend across the full range of the curriculum. The financial health of our university will depend on our ability to marshal assets other than tuition dollars to support the annual budget. In 2020 we express this as the need to “grow the endowment while restraining the growth of the annual budget.” The investment team is now building an extensive record of excellence, and our rates of return compare very favorably with our peer group. The growth in the annual budget has been about the lowest of any school with which we usually compare ourselves. We could not have grown the endowment as we did without the sustained, generous engagement of our alumni. Last year in our THIS IS WHY campaign we raised more than $40 million, which allowed us to surpass our total goal of $400 million. I am particularly grateful that so many of our contributors chose to support our major institutional priorities, the main one being to endow more financial aid and enhance access to our distinctive, pragmatic liberal education. This is final year of the THIS IS WHY campaign, and our success last week with Giving Tuesday is more proof that our alumni are confident in our university’s future and want to be a part of it. We are building momentum to close out the campaign this year with a flourish. The more I talk to our students, the more I am convinced of the power and meaning of the Wesleyan promise: boldness, rigor and practical idealism. Of course students want more contact with professors in informal situations, and they want mentorship about how to navigate the job market. They want even more opportunities to build community – more opportunities to get together and make connections across disciplines, social classes, and ethnic groups. And, these being Wes students, they want to cultivate this community while all the while retaining a very strong individualist streak. And they’re willing to step up and work for change when they see injustice, be it institutional racism in this country or mistreatment of refugees abroad. Our alumni offer the best testimony to this view of pragmatic liberal education. Whether they are in business, the arts, research, sales, banking, or the not-for-profit sector, Wes alums report that they continue to draw upon their education for decades after graduation. If you spend time with our students, it is hard not to be impressed by their range of interests and concerns, their ambition and sophistication, and their commitment to helping Wesleyan increase its capacity to pursue its mission. Yes, the economy does create real anxiety about jobs and about the appropriate preparation for life after college. Many are eager to hear more from alumni about how they navigated the world after Wesleyan. For all their differences, Wesleyans consistently prize the student culture here for its stimulation and its supportiveness. Our students usually feel very much at home at Wesleyan, even when they have a drive to improve it, to make it more equitable and inclusive. When they demand improvements to our university, it is because they are invested in its promise. Improve we shall! As we make progress on the strategic goals of 2020, we are working together to keep that home comforting as well as empowering: a place that launches students into the world while remaining a nourishing environment in which they always feel welcome.